Let's not beat around the bush any longer. Anyone in the market for a high-end graphics card that doesn't necessarily break the bank should take a good look at Palit's GeForce GTX 770 OC. Available for £230 including Assassin's Creed IV, this is a card that offers bags of gaming potential at high resolutions, and with Palit's factory overclock and custom cooler, it's served in a package that runs suitably cool under load. As a complete graphics solution there's very little to criticise, but if we had to pick out a caveat, it's that the 2GB framebuffer may prove to be a limitation in years to come. Though, we wouldn't be too worried about that right now. Essentially a GTX 680 in a new-and-improved guise, the Palit GTX 770 OC is proof that even former champions can return to deliver knockout blows. 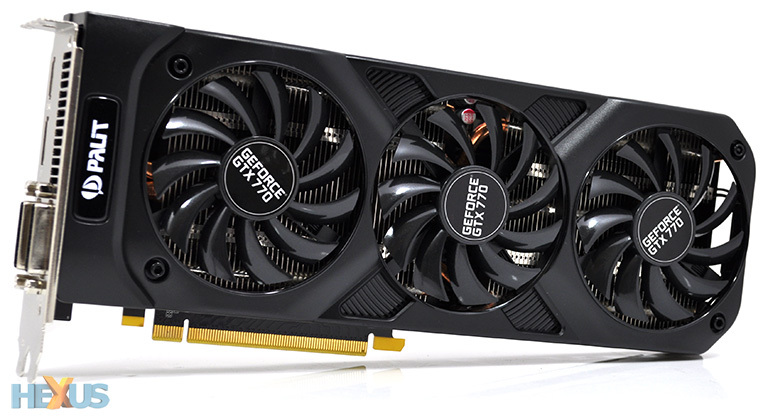 The Palit GeForce GTX 770 OC graphics card is available to purchase from Dabs and Amazon UK. Smart gamers card, just a shame the power consumption is so high compared to the reference card - the advantage of gk104 based cards like this is you're usually getting great gaming performance per watt and not wasting resources on compute that you might not need, but if titan based cards use less power that advantage is gone. I've got a couple of 4Gb Palit 770s, that quite happily bob along at 1185 (although to be fair, cost me a wee bit more than the price of this 2Gb). Just off to see how far I can push them..
Well i have in my case 2x MSI GTX760 Twin Frozr 4GB GPU's and on scan they are for sale for £236 each. But i would think a better investment. Both the 770 and 280x seem good buys with the large leap in price between them and the next rung up of AMD or Nvidia GPUs right now. I'm tempted to replace my ageing 560Ti with one.